Dell 4820D Server Rack. This cabinet is 1200MM deep. High Density rack with additional PDU mounts in the rear of each cabinet. Each unit is complete with doors and side panels. Casters (wheels) are included. Please let us know if you have any questions. Refurbished Grade B: Dell model 4820D – Deep Server Rack Enclosure. Offers IT managers the ability to mount all power distribution units and cables necessary to complete an installation faster than ever before. Newly designed to accomodate the 19-inch wide rack mount components, and bear the weight up to a full 2500lbs. Extended room for cables in the rear of cabinet and PDU management makes this cabinet different than the older models. 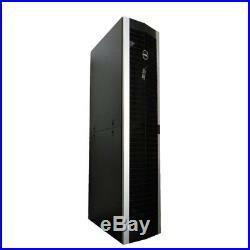 The Dell 4820D server cabinet offered here from Global 1 Resources is in Refurbished B condition (small cosmetic issues) 100% functional, and is ready for installation. All features listed below are included. Grade B – Refurbished (small cosmetic issues) 100% Functional. 89.5″ Height x 23.5″ Width x 47 Depth (1200mm). Compaq ProLiant / HP. Dell servers (Poweredge and Powervault). SOLID LOCKING SIDE PANELS (SECTIONAL). EXTRA DEEP RACK FOR ADDED MOUNTING SPACE (NICE FEATURE FOR PDU/CABLE MGMT). 80% PERFORATED LOCKING FRONT DOOR. 80% PERFORATED LOCKING SPLIT-REAR DOORS. CABLE MANAGEMENT IN REAR OF RACK. CABLE ENTRY IN FRONT & REAR. NUMBERED “U” SPACING FOR RAPID/QUICK INSTALL. QUICK RELEASE SIDE PANELS. NEED MORE THAN ONE? Our refurbishing process is certified, and operates in an R2, ISO, & OHSAS certified facility. This guarantees the highest level of repair, worker safety, and environmental safety. All sales are final after 30 days. We are here to work with you and make sure you receive exactly what we offered. Contact Global 1 Resources with any questions. ONLY in the lower 48 states. ONLY is the lower 48 states. Please provide PHYSICAL ADDRESS for your order. All items are sent by UPS or FED EX. To any commercial location in the lower 48 states. Additional charges will apply to multiple items. All items are cleaned, inspected, wrapped, packaged and strapped. Service is included in the flat rate. Item(s) will be dropped off curbside, or at dock level. New York City and Canada. Deliveries, some charges may vary if access is limited. Items can be delivered but will have this accessorial charge. This includes but not limited to schools, universities, residential businesses, non-business/commercial locations. PLEASE CONTACT WITH QUESTIONS. Just give us a call! See Terms of Sale.. We encourage all buyers to inspect item(s) prior to accepting the merchandise. Please understand that we are willing to work with you under any circumstance, but these terms will be applied at all times. Global 1 Resources. Global 1 Resources is changing the way we see IT. We are dedicated to helping you find the right server cabinet or rack mount accessory for your current or upcoming project. We also carry a large selection of refurbished networking and computer equipment. Global 1 Resources operates in an R2, ISO, and OSHA certified facility. This means we guarantee the highest level of refurbishing & reuse in the WORLD. For additional items and inventory. Global 1 Resources is available 5 days a week: M-F. Facility Location : 215 W. San Antonio St – Bldg. 500 San Marcos, TX. Get images that make Supersized seem small. Tailor your auctions with Auctiva’s. Track Page Views With. Auctiva’s FREE Counter. The item “DELL POWEREDGE 4820 DEEP SERVER RACK ENCLOSURE 48U 1200mm CABINET” is in sale since Monday, December 10, 2018. This item is in the category “Computers/Tablets & Networking\Enterprise Networking, Servers\Racks, Chassis & Patch Panels\Rackmount Cabinets & Frames”. The seller is “global1resources” and is located in San Marcos, Texas. This item can be shipped to United States, Canada, Mexico.